The new panels at Big Chimney and Cedar Falls Jct. have been installed and... hit the drum roll please... THEY WORK! Not that I had any doubt about whether or not the SBS components would operate as advertised. The question was whether or not yours truly could hook everything up correctly and have it actually perform as it was designed. And so far, everything looks OK. The photo below shows the new panel installed at Big Chimney. Note the repeater signals on the fascia. 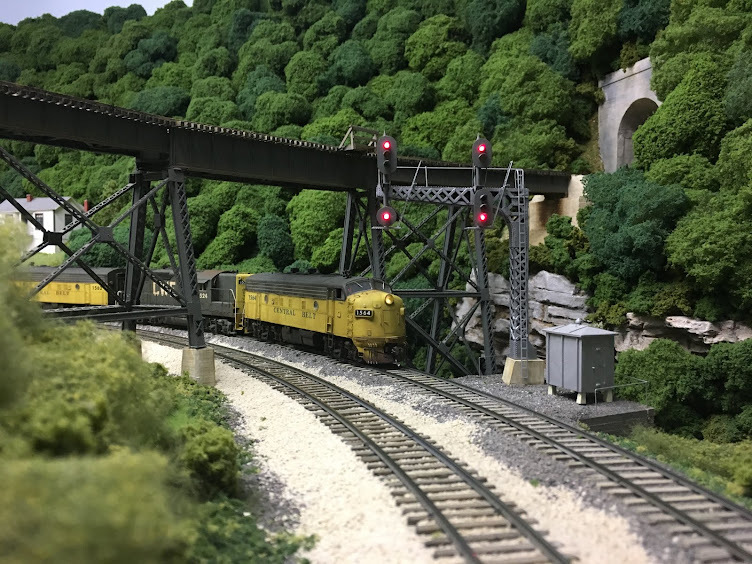 The westbound signals on the cantilevered signal bridge at the west end of Big Chimney can be difficult to see and the dwarfs can't be seen from the aisle. Repeater signals were necessary to insure that crews would know what aspects were being displayed. In the photo above, the turnout at the west end of Big Chimney is lined for the main and there are at least two clear blocks heading west. In the photo below, the turnout is lined for the siding and there are two clear blocks westbound. 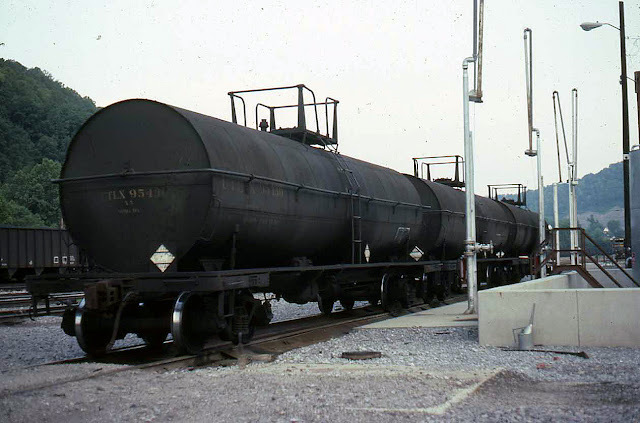 In the photo below, the turnout at the west end of Big Chimney is lined for the siding and the turnout at Petersburg Jct. is lined for the branch. The name of the aspect shown for the siding is Approach and the indication is Proceed prepared to stop at the next signal. The westbound crew can expect to find a Stop indication on the westbound main signal at Petersburg Jct..
Last up is a shot of the new panel at Cedar Falls Jct. The repeater signal shows the aspect for the westbound main signal which isn't visible from the aisle. A bit of touch-up paint is needed on the fascia around the panel. These two panels took an inordinate amount of time to complete due to the repeater signals that had to be wired up. The next three panels are fairly simple and should go together much more quickly. I need to thank Gerry Albers, who is the mastermind behind SBS, for all of his time, effort and support in getting the RCS cards up and running. His patience with my lack of electrical knowledge and never ending questions has been a Godsend, and everything you've seen that's either signal or push-button route related has been a result of his help. But even more special than all of the help has been the friendship- thanks a million, Gerry. Over the last month or so, I've been working on a number of small structures and details for various areas on the railroad. Several of the small structures are part of my efforts to make some progress on the engine terminal at North Pierce. I learned long ago that it is best to work from the backdrop toward the edge of the fascia when doing scenery work. And as usual, one thing leads to another. In order to put down the last layer of scenery materials in and around the supply tracks, which are closest to the backdrop, several small structures needed to be built and placed in position so that the scenery could be built up around them. The first structure was the pump house for the diesel fuel storage tank. It was scratch-built using Evergreen sheet styrene and Grandt Line doors and windows. Also shown in the photo above are diesel fuel unloading cranes. These were scratch-built using Williams Brothers pipe fittings and Evergreen channel. The concrete foundations are small, square pieces of plaster. These were common on the C&O and the L&N. The photo below shows similar cranes on the L&N at Hazard, KY in a photo taken by Stuart Thayer. If I had studied the photo a little more closely, I would have added the shut-off valve near the base. Sigh. Next up is the inspection pit. The base for this is an ash pit that was part of a craftsman kit that my Stepfather built many years ago. I still have the ash conveyor and if I ever get around to back-dating to steam, I'll use it here. My original plan was to simply cover the pit with styrene and weather it to look like steel plate. Then I got the idea of an inspection pit. In checking some photos taken by Everett Young of the C&O engine service area at Martin, KY, there appears to be a yellow railing around a small section of one of the tracks. It certainly appears to be an inspection pit of some type. The railing are from Tichy as are the stairs to the pit. While studying the photos of the Martin, KY yard, I noticed a small, red box on the side of the station. Speculating again, it appeared to be a fire extinguisher box of some type. The Atlas GP38 and GP40 come with a small equipment box of some type. I've never found an explanation for exactly what it's supposed to be, but it sure looked like it could make a neat fire extinguisher box. The only challenge would be finding decals small enough to label it. Then along comes Robby Vaughn who seems to be able to create just about anything, from cast resin 60 ton L&N hopper cars to decals so small you can't read them. He put together a great set of "FIRE" label decals and you can see some of them in the photos below. And last up is a quick update on scenery. The bridges at the engine terminal are finally under way and the photo below shows the progress so far. This is one of the last major scenery projects on the railroad and will take some time to complete. The first objective is to get the bridges in place so that operations can resume. More to follow on this project.